What you need to do before, during, and after the entire mortgage process to make sure you are getting the right loan for YOUR own financial situation and goals. It’s not a one mortgage fits all these days. 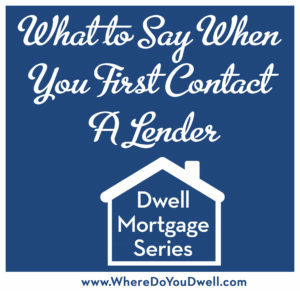 This week’s article is all about what to say when you first contact a lender. And, guess what?! It’s not “How much can I be approved for?” No, no! Most people can be approved for much more than they want to spend. We’ll teach you exactly what to say and how to say it to make sure you’re getting what you need before you start house hunting. It’s always good to shop around for a lender to see what mortgage opportunities are available right now. Different lenders can offer different programs. This doesn’t mean just researching on the internet (that’s okay to get a general idea! ), but rather making appointments to talk to two to three lenders on the phone or in person. With all the mortgage options out there, lenders really need to ask you specific questions to learn more about your goals in order to make sure you have the correct mortgage. Remember, it’s not a one-size-fits-all kind of mortgage anymore! You may already know that you will need to gather financial information for your lender to review — pay stubs, bank account statements, W-2s, tax returns, information on current loans and credit lines. But, do you know what you need to say to your lender? Your initial discussion with your lender can affect the pre-approval amount that they give you. You want something that truly matches your budget, and not the highest amount you can be approved for (that would steer you toward out-of-budget homes!). Lenders will look at how much you can afford when they review your financial information and to determine a pre-approval amount. However, how much you can afford isn’t the same as how much you want to pay per month. We have a lot of clients that will make a blanket statement — “I want to spend $400,000” — since their lender pre-approved them for that amount. However, when we ask them how much they want to spend per month, it’s often much lower than the price range they were approved for! Since many buyers can be approved for much more than they want to spend every month, you need to avoid this from happening to you. You want the lender to go the other way – focus on your monthly payments first then figure out price. Keep reading to see why this system is better! Tell them the total amount of cash you want to put into your home purchase (not a percentage of downpayment because you also have closing costs). These two factors are THE most important factors in getting the loan that’s right for YOU. No longer do you need 20% to put down, and sometimes that is NOT the best option depending on your goals and finances. With these two pieces of information, then ask the lenders you’re talking with to go “backward” to determine the corresponding price range. By working this way, you’ll be approved for an amount that is equivalent to the monthly payments that work with your budget. Our answer is always—if you are spending between 33% and 40% of your income on housing, that is considered a responsible house payment. However, you should adjust your percentage according to your expenses. For example, if you know you’ll be paying for two daycare payments every month, you may want to go on the lower side of that range. Dwell Residential Mortgage Rule of Thumb: When calculating your monthly budget, keep this rule n mind: Every $10,000 in purchase price only adds an additional $50 to your monthly mortgage payment. This makes it easier to find that perfect balance between the funds required for purchasing a home and your monthly mortgage payment. We believe going backward – getting your monthly payment determined — is the one and only way to make sure you get the house you want for the price you want. Here’s another reason you never want to begin with a blanket price. Even if the purchase price is exactly the same, your monthly payment could be very different between two properties. For example, the monthly payments for a $500,000 condo will be completely different than for a $500,000 single-family home. There are different costs you’d need to consider for each option, such as condo fees. Monthly payments can vary depending on where and what you buy. By focusing on monthly payments, you’ll know if you can really afford a home or not. Let us know if you have any questions. Next week’s How to Get the Best Mortgage series will feature the topic: “How Much Do I Need for a Downpayment.” So stay tuned!